2005 – Barrett-Jackson sells a one-off Oldsmobile F-88 Concept Car for $3.24 million. 2006 – Barrett-Jackson makes headlines by selling a 1950 GM Futurliner bus for $4.1 million. 2007 – Barrett-Jackson sets an all-time record when they sold Carroll Shelby’s personal 1966 Shelby Cobra 427 “Super Snake” for a staggering $5.5 million dollars. 2008 – Barrett-Jackson auctions off cars from the hit TV show Monster Garage. 2009 – Barrett-Jackson auctions off hundreds of concept and prototype cars from the GM Heritage Collection, and sells a rare Ford Tri-Motor Airplane for $1.21 million. 2010 – The top seller is a Hamilton H-47 Metalplane, which sells for $671,000. Other big sales included a 2011 Mustang Glass Roof Coupe for $330,000 and a 1966 Shelby GT350 Fastback for $247,500. 2011 – This was a rough year for the collector market, with the economic recession putting a damper on things. The top seller was a 2012 Ford Mustang Boss 302 Laguna Seca edition for $450,000 – followed by a 1950 Mercury Custom Coupe and a 2005 Ferrari 575 Superamerica selling for $330,000 each. 2012 – Barrett-Jackson debuts “The Salon Collection” featuring highly desirable collectible automobiles from Duesenberg, Isotta-Fraschini, Pierce-Arrow, Packard, Delahaye, and other prestigious marques. Highlights include a Mercedes-Benz 300SL Gullwing Coupe selling for $2.2 million, a Ghia-designed DeSoto Adventurer Coupe concept car for $1.43 million, and a 1933 Pierce-Arrow Silver Arrow that sold for $2.2 million. 2013 – Barrett-Jackson celebrates the memory of Carroll Shelby with over 50 Shelby vehicles up for auction. They also sold the Original #1 Batmobile for $4.6 million. 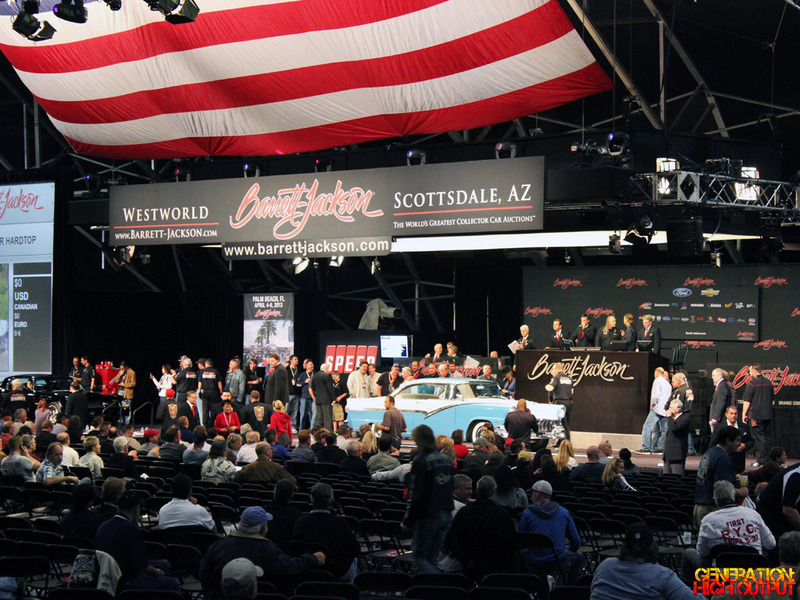 2014 – The Scottsdale Auction was held in the all-new permanent auction building this year. Simon Cowell’s Bugatti Veyron fetched a $1.375 million price, while a Ferrari F40 from Gas Monkey Garage sold for $643,500. 2015 – Barrett-Jackson auctioned off an amazing collection of 140 American classics and customs from the Ron Pratte Collection. Sales from the Pratte Collection topped $40.4 million. 2016 – The 45th Anniversary of Barrett-Jackson was highlighted with the sale of a 2015 Porsche 918 Spyder Supercar, which sold for $1.76 million dollars. So what can we look forward to in 2017? The January 2017 auction will feature the Charlie Thomas Collection. 141 collector and classic vehicles will cross the block. Charlie Thomas made his fortune through car dealerships in Texas. At one point, he owned 50 dealerships in Texas, Louisiana, and Mississippi. He sold many of them to AutoNation and is now down to 14 dealerships in the Galveston, TX area. Charlie’s car collection covers a broad range of American history, from a 1929 Studebaker President to a 1981 DeLorean DMC-12. The bulk of the collection consists of original and restored 1950s and 1960s Ford and Chevrolet cars – which is the era of vehicles that Barrett-Jackson is best known for. Lot #1016 – A 1970 Dodge Challenger coupe that has been updated with an 8.0L V10 engine from a Dodge Viper. Lot #2016 – A Chevrolet Yenko Chevelle 2 door hardtop with a column shifter – the only one known to exist and one of just 22 ever built. Lot #2049 – An extremely rare all-original 1969 Ford Mustang Boss 302 Fastback that was originally ordered by a retired Ford employee. We are eagerly looking forward to the Charlie Thomas Collection and to the other cars that will cross the block from January 14-22, 2017 in Scottsdale, Arizona! Be sure to follow Generation: High Output on our website, Facebook page, and Instagram for auction updates and highlights. This entry was posted in Barrett-Jackson and tagged barrett-jackson 2017, car auction, Scottsdale by Trevor Freeman. Bookmark the permalink.